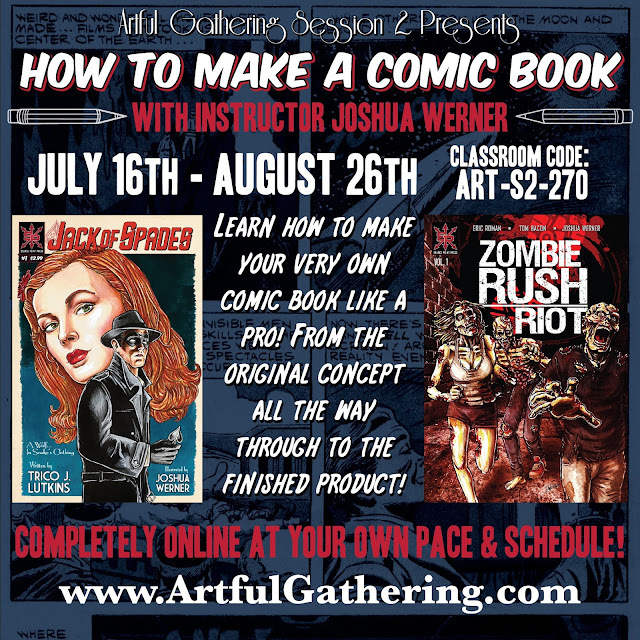 The Artful Gathering Online Art Retreat class "How to Make a Comic Book" opened today! But it's not too late to sign up, if you hurry over to www.ArtfulGathering.com you can still register and jump in on the fun! You'll get 6 weeks of access to a bunch of detailed videos that walk you through every step of the comic creation process, from the script to the finished product in your hands. Plus you'll have 6 weeks of my full attention so that I can critique what you're working on, answer any questions you might have, and customize the class to suit your personal interests and needs to make sure that you get as much information as possible. I'll even help you tailor your pitch to a publisher if you'd like! Some of the topics covered in the class: Setting up your page, Script writing, Panel layouts, Penciling, Inking, Character conception, Lettering, Preparing your files for the printer, and more! So if you want to know how to independently create a professional looking comic, this is the class you'll want to take. I hope you jump in on it! Completely online, at your own pace, on your own schedule!